Your natal Neptune can show your spiritual side, where you're most vulnerable, where you're most compassionate, and where you're most in a haze. Since Neptune is slow-moving, the house position is more important than the sign position. With your natal Neptune in Aries, you can believe strongly in your beliefs, but may not subscribe to any traditional views. You have an active imagination and can jump into creative projects that will make your dreams reality. You want to improve life for everyone, and can win people over with your beliefs. With your natal Neptune in Taurus, you can be obsessed with your dreams, unable to focus on anything else, and this allows you to keep going no matter how many problems you encounter along the way. You can be creative and are drawn to beautiful objects and the arts. With your natal Neptune in Gemini, you have a developed third eye, almost making you psychic, and can inspire others with your words. Your mind can wander, getting bored easily. You may study metaphysical subjects, communications, or mathematics. You may take a logical approach to religion. With your natal Neptune in Cancer, you’re dedicated to your home, family, and country, and try to make them as beautiful as possible, though you may have a hard time seeing reality with them. Your dreams tend to be focused on the home and family, and if you don’t become too idealistic, you can create a wonderful domestic life for yourself. With your natal Neptune in Leo, you have a big heart and are highly creative. You love drama and are attracted to the entertainment industry, the arts, and anything beautiful. You’re charismatic and people are attracted to you. Your inner child can be strong, no matter how old you are. With your natal Neptune in Virgo, you want to help other people through making them healthier. You take alternative approaches to medicine and see the linkage between mind and body and how damaging stress can be. You try to do the right thing no matter what, and expect others to do the same. With your natal Neptune in Libra, you strive for peace and harmony, not just in you own life but in the world. You can have a hard time making decisions, going back and forth. In relationships, you need to work with your partner so you’re equals, and find middle ground with them. 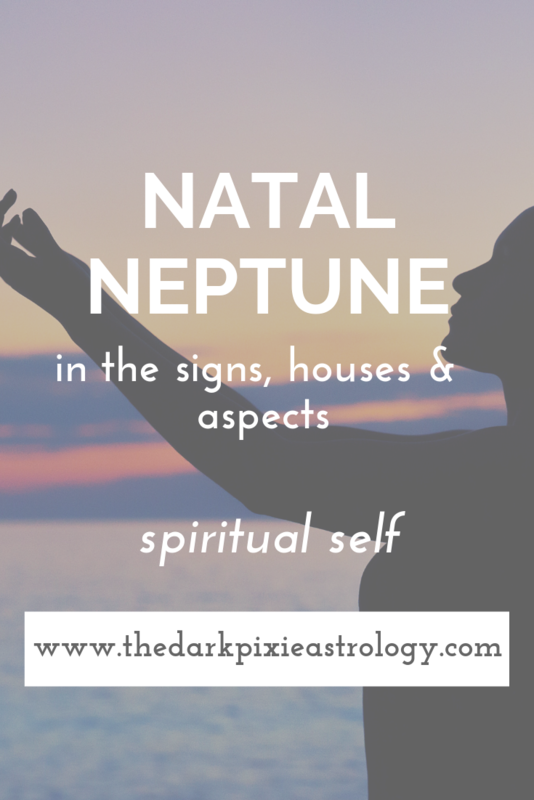 With your natal Neptune in Scorpio, you’re attracted to the dark side, and you want to have deep spiritual experiences. You just need to make sure you don’t take to addiction in order to achieve the heightened states of consciousness you want to experience. You’re passionate, interested in the occult, and want to transform your life and the world. With your natal Neptune in Sagittarius, you love a big idea, and you enjoy expanding your mind and world in some way. You can be attracted to unusual beliefs, fantasy, and science fiction. You search for one truth, but it can be hard to find. You need to recognize there are many answers. With your natal Neptune in Capricorn, you want to achieve something in your life, and can be practical with your creative ideas. When it comes to your beliefs, you can go for traditional views, or find inspiration through the arts. You may wish life was more fair and rewarded hard work more than it does, and have to learn to accept life as it is. With your natal Neptune in Aquarius, you want to be free to be yourself, and embrace originality, individualism, and innovation. You’re a humanitarian at heart, and want to help the world in some way. You can bring people forward towards the future, and you’re focused on the future. With your natal Neptune in Pisces, you can sacrifice whatever it takes to help other people. You’re spiritual, attracted to the mystical and metaphysical, and are inspired by the arts. You can see things more clearly than others through your intuition, or have a hard time grasping reality because your emotions cloud your judgment. With your natal Neptune in your 3rd house, you may have a hard time learning in the traditional sense, and don’t do well trying to learn through books or have a hard time understanding teachers, so you may have struggled in school. You learn best by using your imagination, seeing it in your mind, and absorbing information almost intuitively. You have a hard time with the facts, the details, and might always find yourself running late. You may be creative, artistic, and have a gentle way of communicating that people find charming. You have to learn to be more clear in what you tell people so there’s less chance of a misunderstanding. With your natal Neptune in your 4th house, growing up was likely hard to do in your home as a kid. Your parents likely weren’t the strong parental figures they should have been for some reason. As a result, you learn that family isn’t just your blood relation, and create a family out of the people you encounter and grow close to in life. Responsibility can be too much for you to handle at times, and you run away. Conversely, you can be a mother figure to others and try to win people over through your nurturing nature. You have to make sure you don’t let people walk all over you because you’re desperate for love. With your natal Neptune in your 6th house, you may have a hard time dealing with the mundane aspects of life, and this can make you irresponsible if you take it too far. You can help others in big ways, but then not take credit for it and let them take advantage of you. The 6th house rules your health, and you may suffer from illnesses that are hard to diagnose, are rare, or are sensitive to treatments. Alternative approaches may work best for you. Since the 6th house can show work you may do in life, with Neptune in this house, you can work in the arts, music, something to do with feet, animals, or water, or through the metaphysical, spiritual, or subconscious. With your natal Neptune in your 9th house, your faith is strong. You have a strong connection to your beliefs, and you believe that everything will work out just fine, but that thinking can lead you to not be an active participant in your life, and it passes you by. You need to take control and actually get moving. Details can escape you, so try to be more practical with your goals, and not get so caught up in the big idea. You also need to be leery of people who might try to take advantage of your faith and pull you into beliefs that aren’t good for you. This position can be great for a teacher or writer. With your natal Neptune in your 10th house, you can wander with your career for some time before you figure out what you want to do, and struggle with making clear goals in your life. You may avoid responsibility or making any adult decisions, especially if your childhood wasn’t stable. You may not care much for the spotlight, but others can take advantage of you for that, so you need to allow yourself to be praised for your work. Since the 10th house can show the career you may have in life, with Neptune in this house, you can have a career in the arts, music, something to do with feet or water, or through the metaphysical, spiritual, or subconscious. With your natal Neptune in your 12th house, you’re highly intuitive and have true faith, and this helps you in most situations. You’re compassionate and sensitive, but may have a hard time showing that to others, instead hiding it away. The 12th house does like to hide the energies of the planets within it, so you can hide your compassion, your spiritual self, and worry about showing vulnerability. Until you develop a strong spiritual side, you may be prone to running away from things in life. Know that you are a strong person, and you’ll make it through anything life throws at you. With your natal Sun conjunct your natal Neptune, you’re a dreamer. This can mean you’re either extremely creative or spiritual, or unrealistic and impressionable. You have a hard time remembering things correctly. During your childhood, you had a nonexistent father or father figure, or an early life that lacked structure or boundaries. You’re a compassionate person who wants to help other people, but have to watch for being taken advantage of. With your natal Sun sextile or trine your natal Neptune, you’re sensitive and artistic, compassionate and spiritual. You want to help other people, and have an affinity for animals. You can find a balance between helping others without completely sacrificing yourself, and can come across as a sweet person. With your natal Sun square or opposite your natal Neptune, you want to feel or experience something extraordinary. Your early life lacked a father or father figure, lacked rules or support, or didn’t help you form your own identity. You have to watch for being attracted to all of the wrong people. You can be self-destructive or escapist. You’re sensitive and bruise like a peach, and need to forge a stronger connection to reality. With your natal Moon conjunct natal Neptune, you have an active imagination and love to daydream, but you could daydream your life away. You need to have a strong spiritual self, and feel instinctually. You’re highly sensitive, and this can be your biggest asset or liability. You care a great deal for others, but you can also be irresponsible, insecure, and act like a martyr. With your natal Moon sextile or trine natal Neptune, you’re a compassionate person who wants to help others however you can, and always seem to know what other people are feeling. Your imagination is active and you need a certain amount of time away from the real world. You have excellent intuition. You may have a hard time actively pursuing your goals, and have to cultivate that trait. With your natal Moon square or opposite natal Neptune, you can be erratic emotionally, high one minute, low the next. You can be unrealistic with what you want out of life, dreaming too big and getting lost in fantasy, or becoming depressed and out of touch. It’s difficult for you to wrangle your emotions and get them under control. You tend to avoid issues instead of facing them, and have to force yourself to deal with problems, otherwise you’ll always put them off and never deal with them. It would be good for you to find a way to channel your creativity into something productive. With your natal Venus conjunct your natal Neptune, you can be a very creative person, and come across as incredibly charming. You may have a hard time seeing the reality of your love relationships, the people you date, or getting a handle on money. You can fall for people who need to be saved, or be taken in for a ride by someone who takes advantage of you. You’re romantic and love love. With your natal Venus sextile or trine your natal Neptune, you have a gentleness to you, are charming, and can express yourself creatively. You have an active imagination and want everything in the world to be beautiful. You’re a generous person, though you may give too much at times. With your natal Venus square or opposite your natal Neptune, you can love someone for who you think they can be instead of who they actually are, and have a hard time seeing them clearly. You’re overly idealistic in love with unrealistic expectations. You desperately want to be loved, and that makes you an easy target for someone who wants to use you. You need to work at facing reality. With your natal Mars conjunct your natal Neptune, you’re charming and easily liked, but you can have a hard time shaping your own personality, and instead become the person that other people want you to be. You have an active imagination and can do things on a whim. You have a good intuition with others but not yourself. With your natal Mars sextile or trine your natal Neptune, you have a wonderful imagination and intuition. You’re sensitive to others and want to help people. You’re a gentle soul, compassionate and understanding. You’re romantic, charming, and honest in love. With your natal Mars square or opposite your natal Neptune, you can be unsure of what it is that you want, and this makes it hard for you to know what or who to keep around and what or who to let go of. You lack confidence and need to work on believing in yourself. Once you do, you can be more assertive. You live in fantasy, and follow your dreams. With your natal Jupiter conjunct your natal Neptune, you have an active imagination and are drawn to fantasy. You’re likely quite creative or artistic. You may have a hard time dealing with reality at times, always wanting things to work out well, and having a hard time dealing with it when they don’t. You may run when faced with problems. With your natal Jupiter sextile or trine your natal Neptune, you’re charismatic and easy to be around, and people like you. Your gut can help you make good decisions. You can be creative, and if so, you can use that to your advantage. You see the best in people, even when no one else does. With your natal Jupiter square or opposite your natal Neptune, you can have a hard time seeing reality, and find yourself confused or mislead. You can go overboard with excess, and that prevents you from getting what you want. Discipline is something you need to learn. You’re giving, but you don’t take the time to figure out who deserves it, and can be taken advantage of. With your natal Saturn conjunct your natal Neptune, fear or paranoia can be trouble for you if you let it. You can give in to people who want to take advantage of your fear, and they’ll use you. You feel responsible for so much in life, and have to learn to believe in yourself, have greater confidence, and allow yourself to explore your imaginative side. With your natal Saturn sextile or trine your natal Neptune, if you can dream it, you can make it happen. You want to merge the mystical and spiritual with the physical, and make them something you can feel in the palm of your hand. No matter how much you may venture into your spirituality, you’re always grounded. With your natal Saturn square or opposite your natal Neptune, you can have a hard time with reality or fantasy. You may feel like you have to stay in reality so much that you reject the mystical and creative, or you may feel like you have to explore the mystical and creative at the expense of reality. Let yourself be creative, but don’t let it wander around without physical manifestation. Work at making it reality. Avoid escapism and build confidence. With your natal Uranus conjunct your natal Neptune, you want to change the world in a big way, and you take different approaches than everyone else. You dreams are unusual and you’re a creative person. With your natal Uranus sextile or trine your natal Neptune, you have an active imagination and are attracted to the unusual. You’re compassionate and want to help the world in some way. With your natal Uranus square or opposite your natal Neptune, you want to change the world, but you may fight with your independent side and feel a push-pull effect. You want to focus on yourself, you want to focus on others, you want to focus on yourself, you want to focus on others. You have to learn to merge your own wants and needs with others who feel the same way. With your natal Neptune conjunct your natal Pluto, you’re an imaginative, creative person, and you need to take your dreams and turn them into something real. You can use your dreams as a way of transforming yourself and your life. With your natal Neptune sextile or trine your natal Pluto, you have an active imagination, and are an intuitive person. You can follow your dreams and make them real, and it happens more smoothly. With your natal Neptune square or opposite our natal Pluto, you can have a hard time dealing with your dreams, believing they’re unattainable for some reason. You may deny any belief in anything, and reject your spiritual side, along with your creative side. With transit Moon conjunct your natal Neptune, your sense of perception can be altered with ease, and this can be positive or negative. Positively, your intuition can be stronger, you can be more in touch with your feelings, and feel overly positive about life. Negatively, you can be unrealistic, easily wounded, and unable to see through people, which can lead you to be misled. Don’t make any concrete plans right now. With transit Moon sextile or trine your natal Neptune, your heart is bigger and you feel quite sympathetic and empathetic. Anything artistic can take hold of you. You may reminisce about the past. Your imagination reins supreme, so give yourself a mini vacation. You can also be more vulnerable, so be careful not to open up too much. With transit Moon square or opposite your natal Neptune, you can long for something from the past, getting caught up in it. Your mind isn’t clear, and making decisions is highly difficult. Depending on what’s happening at the time and how you are normally, this can be an emotionally distressful time. Deception is always an option with Neptune, by you or by others, so don’t give in to illusions. You may feel like running away from it all. Don’t make any long-term decisions or deal with your career or money now. Try to use the time by just letting yourself assess and relax. When transit Mercury is conjunct your natal Neptune, you’re more creative than usual. You can understand the way you’ve been behaving, or come to grips with an old issue. You may have a hard time with reality, and fall into the pit of illusion, delusion, and fantasy. You can have a hard time communicating clearly. When transit Mercury is sextile or trine your natal Neptune, you’re more intuitive than usual. When you look around at the world, you see beauty, and it inspires you. You’re more compassionate, forgiving, and romantic. This is a good period for an artistic project. When transit Mercury is square or opposite your natal Neptune, you have a hard time thinking clearly, and feel like your mind is stuck in a haze. You can’t deal with details or facts. You’re unsure of yourself and question everything, and should hold off on decisions. With transit Venus conjunct your natal Neptune, you’re sensitive, creative, and inspired. You see the beauty in everything, and feel spiritual. Your intuition is heightened, and you’re vulnerable to deception. With transit Venus sextile or trine your natal Neptune, you’re more romantic and compassionate. You have a gentle energy to you, and are kind to others. Listen to your gut. With transit Venus square or opposite your natal Neptune, you’re lost in fantasy for the day. Fantasy is preferred over reality, and you have a hard time dealing with practical matters. You don’t see people or situations for what they really are, instead wearing rose-colored glasses, so don’t commit yourself to anything or make major decisions under this influence. With transit Mars conjunct your natal Neptune, your imagination is active, and you engage in daydreams. You prefer fantasy over reality, and may have a hard time seeing the reality of situations or people. It’s not a good time to make a solid decision. It is good for creative projects and pursuits, romance, and spirituality. With transit Mats sextile or trine your natal Neptune, you’re understanding, helpful, and intuitive. You’re highly creative and want to dabble in a different world. Doing so could inspire you. You’re gentler, kinder, and sweeter. With transit Mars square or opposite your natal Neptune, you don’t want to deal with the mundane, daily life, or responsibilities. It’s hard to be practical. It’s best to just let your imagination take over and leave important matters for another day. With transit Saturn conjunct your natal Neptune, you may be forced to face reality and see that a dream you have isn’t attainable. Make sure you’re being truly realistic about it and not just pessimistic, because it may be something you actually can do. Watch for being overly pessimistic about life and being too worried about things that don’t really matter. With transit Saturn sextile or trine your natal Neptune, you can make your dreams real with a little hard work. You can see how to go about achieving your dreams in a way that’s practical and will get you what you want. With transit Saturn square or opposite your natal Neptune, you may be out of touch with reality, and have a hard time seeing the real problems in your life. You can be more afraid of what you imagine than of what is really there. Don’t let your mind wander too much and your imagination take control, because it’s not very helpful right now. With transit Neptune sextile or trine your natal Neptune, your creativity is heightened, and your imagination active. Embrace it and see how you can use it to your advantage. Your compassion also runs higher, and you want to help others. With transit Neptune square or opposite your natal Neptune, you may sacrifice yourself to help other people, but that doesn’t work in the end, so guard yourself. Your imagination may be active, but you may have a hard time allowing it to flow freely and reject it. Don’t stand in your own way and let your imagination soar.